I have just started the LONG process of turning half of our basement into a workroom for myself. I have a lot of problems to solve along the way so I thought I would share these projects with you as I go. Organizing our embarrassing 700+ DVD collection was the first of these and one I’ve been wanting to tackle for quite a while. We’ve tried organizing them in the past, which left us with 4 shelves tucked in a corner of the basement as seen in the “before” picture, which was still a mess. My goal for the basement is to get rid of anything that we don’t absolutely need… and we certainly don’t need 700+ DVD boxes. 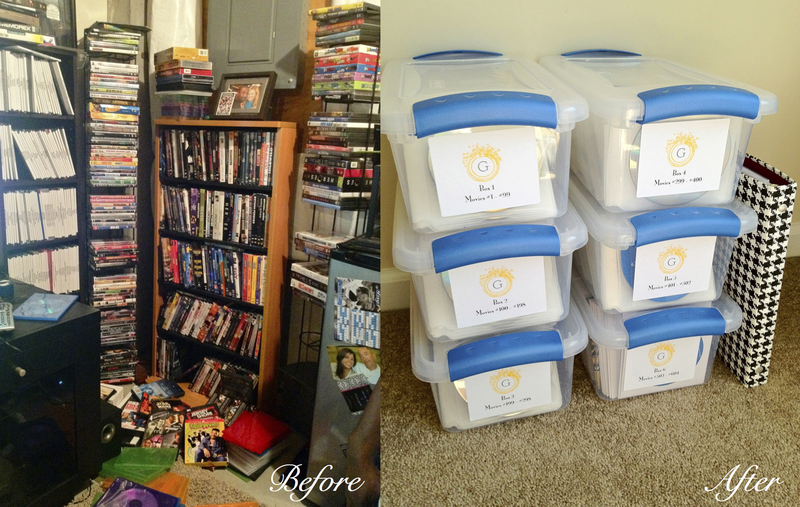 I managed (with lots of help from my husband) to shrink our entire movie collection into a ridiculously organized 6 boxes which stacked as shown in the “after pic” measures just 16″ by 16″! I started by opening up an Excel sheet in my numbers application on my MacBook. I typed in every single movie title and TV Series disk. This made it incredibly easy to alphabetize our collection because once I was done, I just hit “sort by ascending” and it did it for me. Making this list ahead of time also let me know exactly how many disks we had and how many sleeves I would need to house them all. I went to office max and bought these dual sided plastic sleeves which I liked because they fit 2 movies in each and they also have a slip on the side for labeling. I got the clear plastic boxes with latchable lids from Walmart (They’re sold in a set online but I bought them individually at the store). 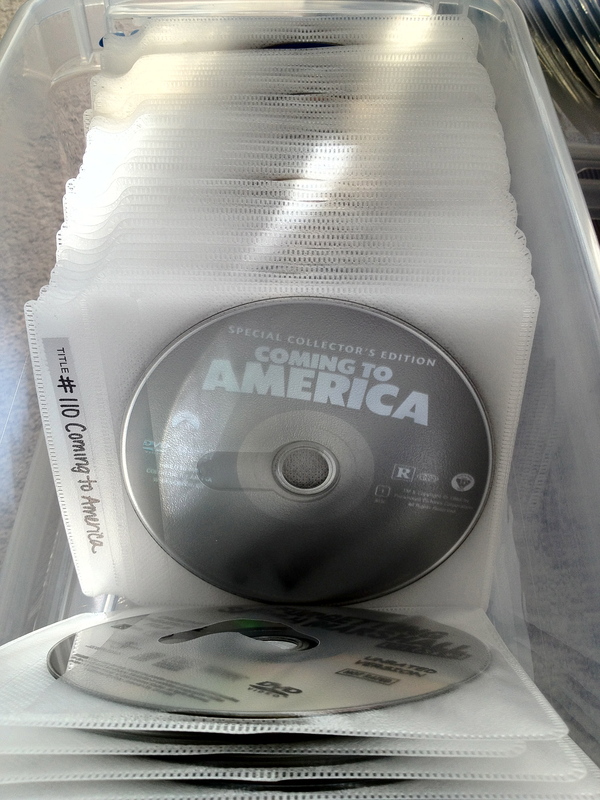 I went through my list, pulled the DVDs out of their cases and put them in the sleeves. 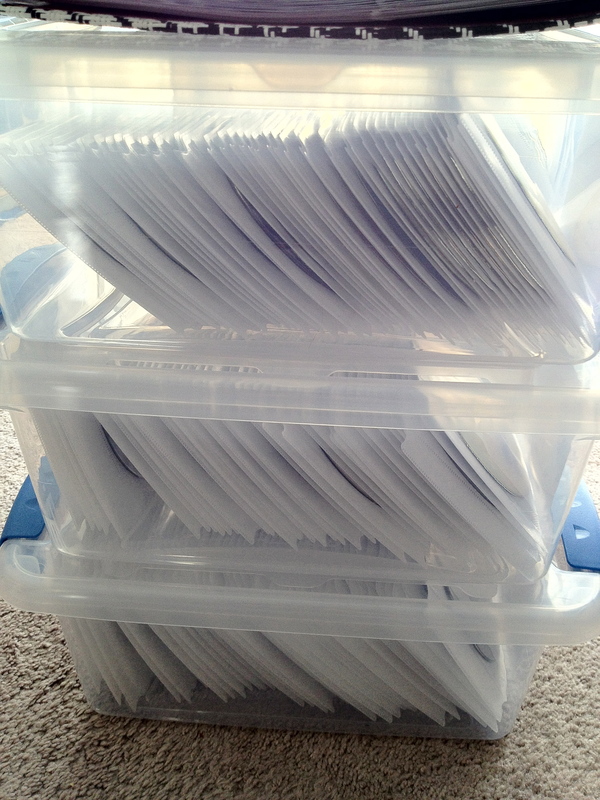 The sleeves come in packs of 50 so I decided each box would get 50 sleeves… I put 1-50 in the fronts of each sleeves then flipped the box around and put 51-99 on the backsides. I used to slips of paper that came with the sleeves to give each DVD a number and their name. 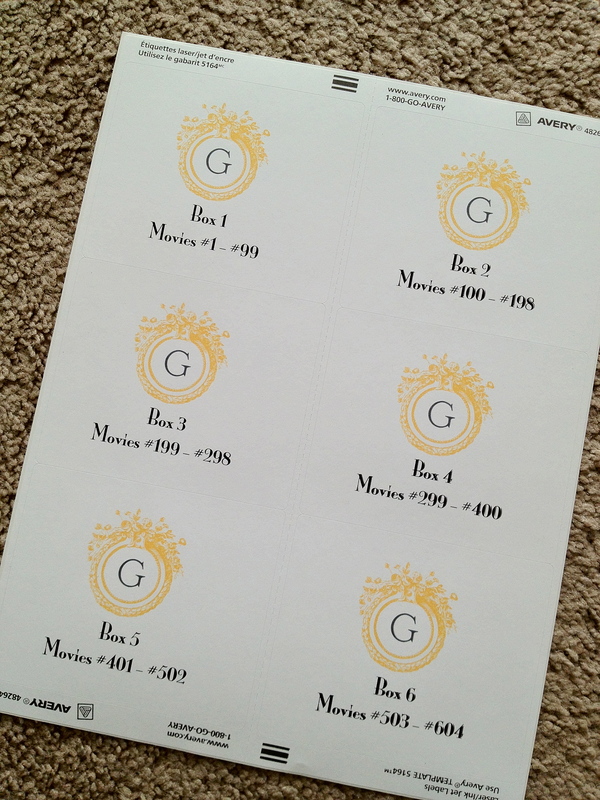 Next I got Avery Shipping Labels and used their free template (#5164) to make the labels for the boxes. I went to a favorite website to make a custom monogram with the first letter of our last name and then labeled the box numbers and which # DVDs were in each box. 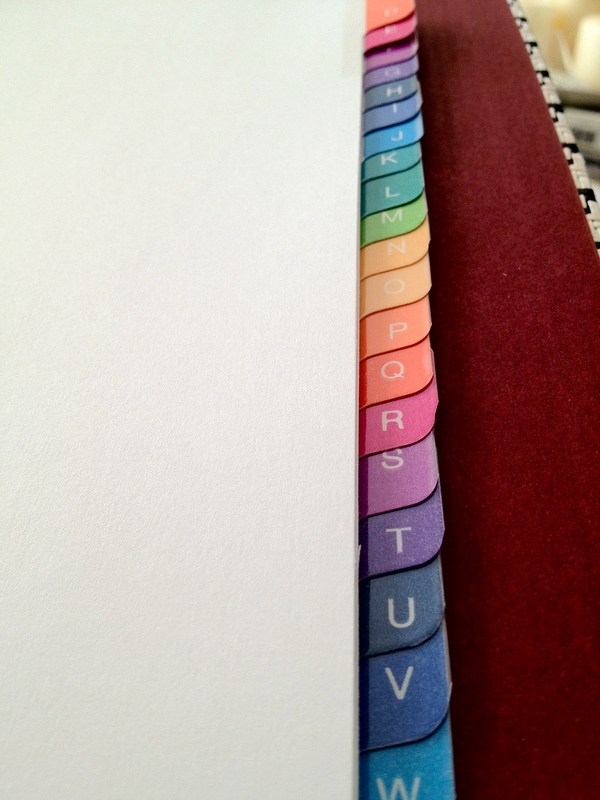 Next, I got a one inch binder and dividers with the alphabet already on the tabs. 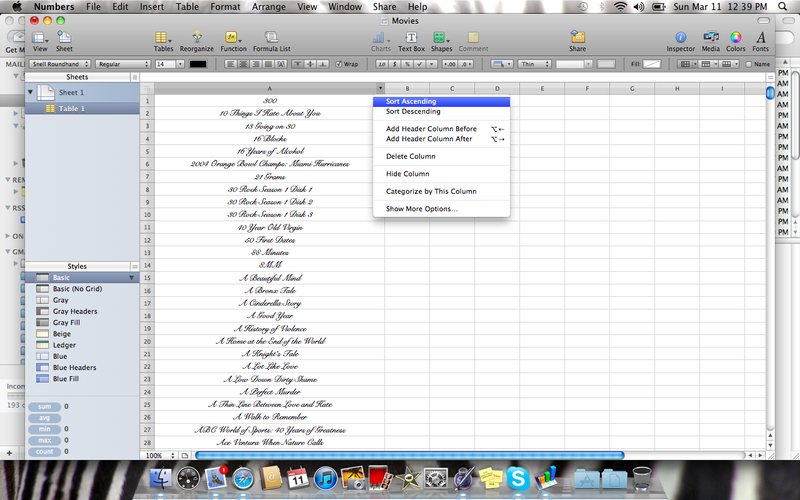 I took my excel sheet and divided the movies up by letters in a Pages document. I printed each set out, slipped it inside plastic sheet protectors and put them in the corresponding letter’s section of the binder. I also included the DVD and box number underneath each movie in the binder. This way when I want a movie I can go to the binder and look under that letter, find the box and DVD number and locate it with ease. I also saved my Pages document as a PDF file and uploaded it to my library on my iPad which means I can utilize the index digitally anytime. As you can see from the side view, if I wanted to use up even less space I could have easily put more sleeves in each box but I wanted to leave plenty of room to make it easy to flip through the DVDs. The best part about this project (other than the fact that it’s over!) is that we were able to get rid of 10 garbage bags full of boxes which we will be able to recycle! Wow! Glad to see I’m not the only one with a ginormous DVD collection! I was just sitting here sorting through all of mine, and decided to look up DVD organization on Pinterest, and there you were! 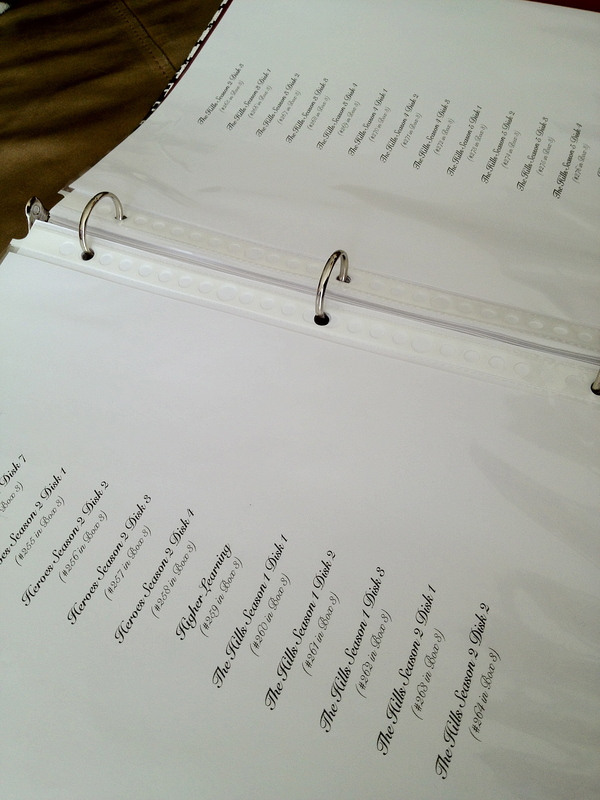 I’ve started doing the same sort of idea in recipe boxes, but I hadn’t thought of typing all the titles to make them much easier to find! Thanks, great post! So glad that you stumbled across it! 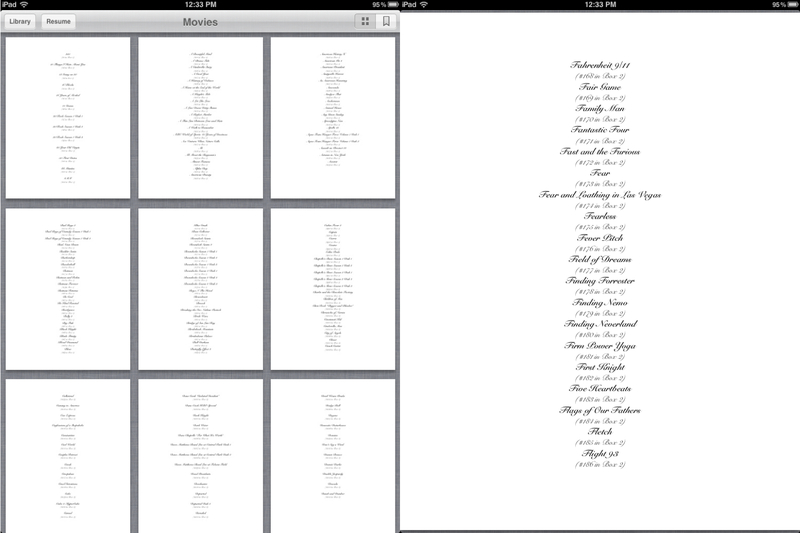 Putting the collection into a PDF makes things SO much easier to find! Even if you alphabetize them it still takes a while to find which box so having them in a document that tells you which box is a life saver!